Every hiring decision has far-reaching consequences - both on the corporate side and for the lives of new employees. We aim to create a platform to empower its users to make excellent decisions. At any time and optimally for both sides. The economy is facing major challenges such as skill shortage, and digitalization in the world of work. Join our digital intern program and take an important role in developing a platform to create strategic solutions to address these challenges. Testing your skills during a ValYouBel work placement will give you plenty to talk about: high-quality networking, digital platforms, and the passion that keeps our clients inspired. Let yourself be inspired too: by giving spirit to technology while you’re still studying and exciting prospects after you graduate. During an internship at ValYouBel, you can apply what you have learned while studying in practice and get to know a successful multinational in all its facets. We give you the space to put your digital skills to the test and discover potential with us that may be decisive for your future career. What exactly you get out of your internship, however, is up to you – your commitment, your motivation, and your desire to make a difference and prove yourself as a true team player. Whether in exciting projects or varied tasks, we count on your ideas and initiative. We offer you the opportunity to work on such specialized projects as ‘Ceo for a day’ or highly exclusive ‘Workshop’ events where top business leaders in Turkey are involved. If you convince us during your internship, we would like to stay in touch with you. We’re only too happy to look to the future with talent that fits with us and inspires us: whether you are at your high school, bachelor's, master's degree, come back to us as a working student, or become a full-time member of our team as a trainee or via direct entry after earning your degree. You will work closely with talent managers or executive management to create engaging content for a company's social media presence, including keeping social media channels updated and brand-focused, while seeking out new social media avenues and ways of connecting with audiences. We are looking for the late high school, university students or higher with excellent command in English (and preferably German as well) who can spend 3 to 6 months with us. Disciplines we’re looking for are engineering, liberal arts, psychology, business engineering, economics, communications sciences, computer science, and business informatics – but we also welcome other degree candidates. We are also glad if you have already completed internships, have spent some time abroad, or can show us that you have pursued extracurricular interests and activities. 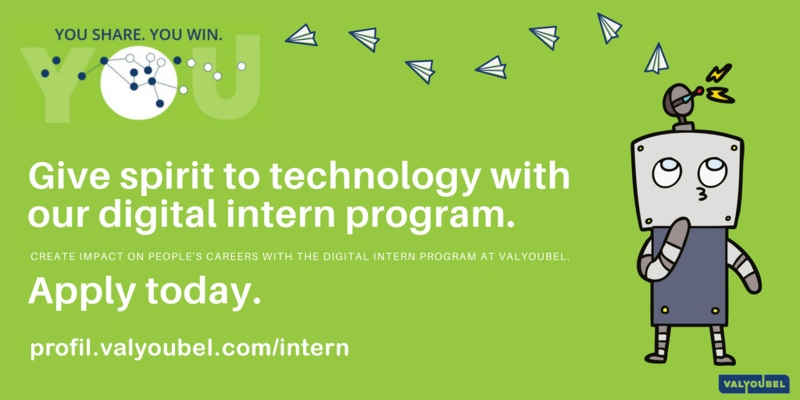 Please note that ValYouBel has committed not to hire graduates as interns. The only exception is the orientation year between your Bachelor and Master degree. Valyoubel is one of the premier international service and technology providers in strategic talent solutions. We offer our clients and the new generation of talent managers unique solutions to attract, integrate and develop their most valuable resource: their talents. We believe in our high caliber teams, innovative technology, and proven scientific tools.